Russo-Japanese War (1904-1905) - In the course of a mere 50 years, Japan transformed from a feudal society into an industrial power. And with that power came expansionist tendencies. The problem is that she wanted to expand into the same region in which Russia was interested. Russia had been on an expansionist trip for centuries. The region in question was Manchuria. As was the usual case, Russia was searching for a warm water port; this time in the Pacific. In order to avert a potential war, Japan offered to stay out of Manchuria if Russia recognized Japan's claim on the Korean Peninsula. Russia refused. At that point, Japan felt Russia was trying to intimidate her and declared war on February 8, 1904. It was a war known primarily for its naval engagements. Russia had two fleets, one in Asia and one in Europe. By the end of the war, it had none (or maybe a half). 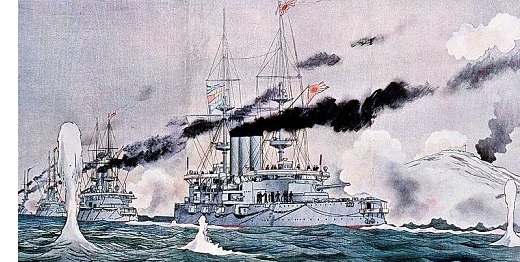 On the very same day Japan declared war (actually three hours prior to a formal declaration), the Japanese Imperial Navy attacked the Russian Far East Fleet at Port Arthur. Russia was caught off-guard and three of her heaviest ships were badly damaged. The battle was ultimately considered indecisive because the port's batteries were able to fend off Japan's ships. But it was a huge psychological blow to Russia and her ships were prevented from sailing as Japan set up a blockade just out of range of the batteries. Russia tried to slip two ships past the blockade at night, but both hit mines; one was sunk and the other badly damaged. To add insult to injury, Admiral Makarov, Russia's top naval strategist in the East was killed. In August, the remaining Far East Fleet tried to break the blockade and was partially successful. Admiral Vitgeft replaced Admiral Makarov and sailed six battleships, four cruisers and 14 destroyers into the Yellow Sea. He was met by Admiral Tōgō (see below) who commanded four battleships, ten cruisers and 18 destroyers. It's known as the Battle of the Yellow Sea and it was the largest naval engagement between ironclad warships at the time. The Russian ships managed to get past Japan's, but the flagship was hit and Admiral Vitgeft was killed (Russia's top two naval officers in the East were now dead). The ships headed for Russian waters and the port of Vladivostok to wait for reinforcements. Of course, it also handed Port Arthur to Japan. Back in Moscow, officials were stunned and Tsar Nicholas II enraged. At the time Japan was considered a second rate power and Russia expected a quick and easy victory. His advisers tried to convince him to accept Japan's original offer, but Nicholas wanted total victory at this point. He ordered his Baltic fleet to sail to the Pacific and destroy Japan's navy. But the trip was beset with problems from the outset. Mechanical difficulties delayed launch of the fleet until Mid-October 1904. Then a week later, while sailing through the North Sea, the fleet came across a number of British fishing trawlers in heavy fog. Thinking that Japan must have dispatched a naval force into European waters, Admiral Rozhestvensky mistook them for Japanese warships and ordered his fleet to attack. Three British citizens were killed, several others were wounded, and in the confusion, some Russian ships even fired on their own fleet. The incident almost led to war between Russia and Great Britain. Although it did not, Britain denied Russia access to the Suez Canal, forcing the fleet to sail around Africa, adding thousands of miles to the journey. The fleet's travails became so well-known, the trek half-way across the world began to garner international attention (which added even more pressure, and allowed Japan to track its progress). That it even completed the trip is astounding all by itself. It traveled a total of 18,000 miles (33,000 km) and consumed 500,000 tons of coal (this was still the age of steam). Finally, the fleet reached the Sea of Japan in May 1905. It chose to take the shorter, riskier path though the Tsushima Straight between Japan and Korea. The fleet sailed through at night in an attempt to avoid detection. But it failed. Japanese scouts spotted the Russian medical ships which had their lights on. The Imperial fleet closed in and annihilated Russia's Baltic Fleet at the Battle of Tsushima. Eight battleships and several smaller vessels were sunk along with 5,000 sailors. The pride of Peter the Great, who had worked so hard to turn Russia into a naval power two centuries earlier lay at the bottom of the ocean. It shocked the world. Russia was beaten and had to sue for peace. President Theodore Roosevelt mediated the negotiations and the Treaty of Portsmouth was signed on September 5, 1905. It was the first time in the Industrial Age that an Asian nation defeated a European one, as well as the first time (ever) that an Asian nation defeated a European one at sea. Japan destroyed Russia's Baltic fleet and seriously weakened its Pacific. The defeat also severely weakened the country and played a role in the Russian Revolution of 1905.